Early this afternoon, as we were packing to head back to Alexandria, a young man walked by the house and, seeing us on the front porch, announced, “The President’s down the street. He’s eating lunch at Parkway.” I was staying at my friend’s house on Lafitte, about a block and a half away from the historic bakery and tavern. So we hurried out of the house and walked over to the Parkway, where a swarm of Secret Service agents had assembled. 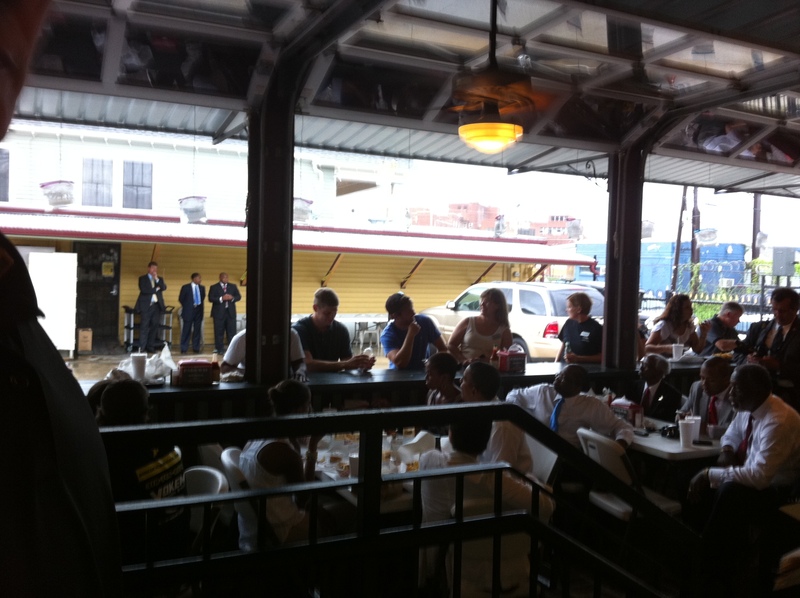 The President’s motorcade was parked directly in front of the restaurant. Of course, no one at the Parkway or in the neighborhood had been expecting the President and his family, and then suddenly, there was a flurry of activity. If you weren’t already in the restaurant or if you weren’t living within a couple of blocks of the place, there was no possible way you could have gotten in. As we approached, a Secret Service agent asked us to empty our pockets and then swiped us down with a handheld metal detector. For the most part, it was business as usual in the restaurant; when we walked in, there were even a few empty tables. 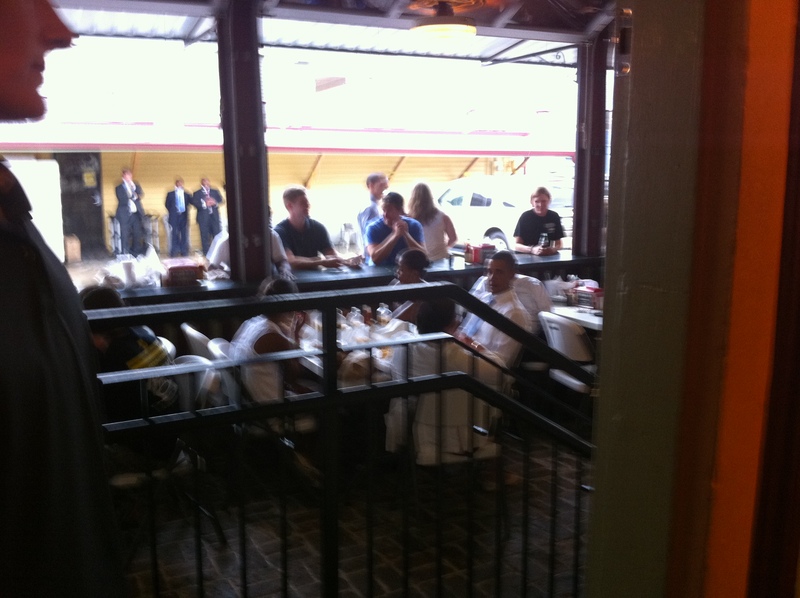 The President and his family were eating lunch in the outdoor patio area. The President and his wife were both very gracious, and Parkway Bakery and Tavern was a great choice for lunch. For over 100 years, it’s been a New Orleans institution, and in the aftermath of Hurricane Katrina, the building was severely damaged. I didn’t notice it today, but the last time I was there, the watermark from the flooding was clearly visible. Most importantly, the place serves a righteous po’boy. This was pure serendipity, and I have to admit: I think it’s particularly hilarious, because this morning, another local blogger, in response to my Deepwater Horizon post, implied I had taken an “assignment” from the White House. Only hours after he posted this, I somehow found myself saying hello to the President, which may actually bolster his dubious claim. Though, as my photos clearly illustrate, I probably don’t yet have the chops to be a White House correspondent. This is important. Did you actually see POTUS eat? Was there food on his plate?